The European Robin (Erithacus rubecula), traditionally known as the "Robin redbreast" is a small common European songbird. The traditional name springs from the distinctive red patch on both males and females of the species. 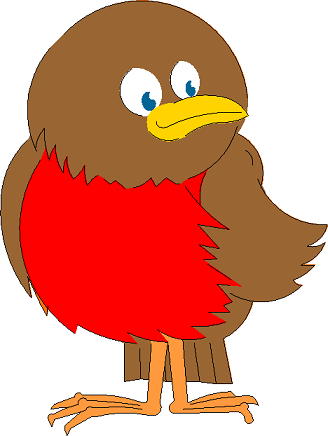 The Robin is very much associated with Christmas and has much folklore associated with it. One legend explains the Robin's red breast: When Jesus was dying on the cross, the Robin, which at that time was wholly brown in color, flew to his side and sang into his ear to comfort him. The blood from Christ's wounds stained the Robin's breast, and from that time on, all Robin's were born with the same mark. The Robin is the state bird of three US states: Connecticut, Michigan and Wisconsin.